Dhanbad coal fields are situated in the state of Jharkhand in the East of India, neighbouring West Bengal, Bihar and Orissa. 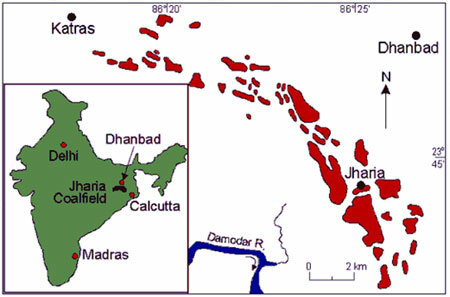 The Dhanbad-Jharia area forms part of a mineral rich corridor, most of India’s reserves in coal, copper, iron ore and uranium are located in the Durgapur-Dhanbad-Bokaro-Jamshedpur triangle. Industrial coal mining started in the second half of the 19th century, subsequently both steel manufacturing and power generation came up in the region. Bokaro is known as India’s steel city, location of India’s biggest steel plant, and currently major investment hub for ArcelorMittal and other multinationals. The steel industry attracted manufacturing industries. After having set-up their steel plant in 1907, Tata opened their truck plant in Jamshedpur in 1945 . In 1952 Nehru opened the Sidri fertilizer plant, which he called ‘temple of development’ and which became the symbol of ‘independent’ India’s industrial 5-years plan regime and cornerstone of the Green Revolution . Up to the early 1980s around one fifth of India’s total public infrastructure and industrial investment went to this ‘Ruhr Area’ of India. The mining and industrial clusters are surrounded by agriculturally backward and jungle-dominated areas. The ‘local’ population in these areas belong to the poorest rural sections in India. They have become important bases for the Maoist armed struggle. The Dhanbad-Jharia coal fields form part of this heavy industrial triangle. They are a rural mining area, with about 110 official coal mines and probably the same amount of unofficial mines. They are India’s main centre for coking coal, a particular sort of coal important for steel production. Scattered in the region are the vast open-cast mines, interspersed with villages and miners colonies. Trucks loaded with coal and heavy machinery dominate the scenery, interrupted by push-carts and bicycles – loaded with coal. The Dhanbad-Jharia region is said to be one of the most polluted areas of the world. Mining in itself is a rather forceful intervention in the environment, but capitalist social relations have resulted in forms of mining, which aggravate the attack on nature and, as part of it, on the human bodies. The productivity drive towards open-cast mining has increased the dust production, the whole area is covered with fine coal dust, causing epidemic respiratory suffering. In order to cut costs, many mines – and not only the unofficial mines – are not re-filled with sand, once the coal is extracted. This results in gas accumulation, underground explosions, underground fires and caving in of whole areas. Since years a large-scale underground fire burns under the surface of Jharia, under the living area of about 600,000 people. Here and there the earth cracks open, gas, smoke and flames emerge. Skeletons of trees, burnt from within. Jharia was declared eviction area in the early 1980s, an official master-plan was set-up to re-located hundred of thousands of residents, but was either not put into place or displaced people were not given compensation – which increased the resistance of people towards being displaced, be it for mining or for ‘their own safety’ in order to escape the underground flames. The industry destroys nature and harms humans – and it creates a different social environment. The industry brings together thousands of people from all corners of Northern India, they live in village-type of settlements, but without the traditional village hierarchies of caste, individual land-ownership and agricultural dependency. Neither is the social atmosphere polluted by the urban stress and feeling of anonymity. One of the major divisions and tragic separation which capitalist development creates is the division into town and village. The town offers a break-away from the misery and cultural oppressiveness of the village, but this urban freedom turns out to be a mirage, hiding stress, lack of breathing-space and social coldness. There seems to be no alternative to this quasi natural dichotomy and the communist trajectory to abolish both village and town seems utopian. The Dhanbad-Jharia coal-fields are everything but a utopia, but they demonstrate that there is a material link between form of community and social activity; that because of the mining work the atmosphere in the villages is more intimate than in a town and more egalitarian than in a traditional agricultural village; that there is the potential of an alternative. Manual workers, degraded and trapped by centuries of caste-based division of labour and still largely culturally oppressed are praised by heroic monuments in the mining region. The acknowledgment of working class’ social power is petrified in the miner’s statues, which can be seen in many squares of Dhanbad area. At the same time we can see the looming nightmare once mining capital would leave the area as the main social cohesive and source of income – yet another desolate place of stranded individuals. The question will be whether we manage to turn the current, destructive form of industrial socialisation into something better. The atmosphere within the mining village is one of relative equality – if we ignore the structural gender inequalities, also imposed by the ban of female employment in the official mines. But between the mining villages themselves are significant differences, reflecting the hierarchies within the mining work-force. This becomes visible in the Bhuli colony, which was built by the Coal India in the mid-1970s, after nationalisation. It was the biggest industrial housing scheme in Asia at the time, comprising schools, hospitals and other ‘planned infrastructure’ for the about 40,000 mine-working residents – while appealing to their rural background by leaving some space for gardening and animal husbandry. If we compare this housing scheme with the current conditions, where a well-planned Industrial Model Town would feature all kinds of access roads and industrial infrastructure, but no provision for workers’ accommodation what-so-ever, Bhuli seems like a proof for the ‘worker-friendly’ character of the nationalisation of mining industry. These company colonies seem the ‘role-model’ of a welfare-type of capitalism-socialism. But more than that Bhuli is an expression of spacial separation within a divided work-force. During the first weeks of nationalisation around 50,000 to 60,000 mainly local workers – some people stress the fact that a lot of them were Dalits (untouchables) and Santhals (tribals) – were replaced by better paid ‘permanent workers’, who mainly came from other regions of Bihar and who were accommodated – and separated – in townships like Bhuli. Today Bhuli or Munidih Project, like many other ‘colonies’ of permanent workers of Coal India, look rather run-down. The three-room family houses with separate gardens are rented to the workers for about 150 Rs a month (they earn about 1,000 Rs a day), but they officially have to be returned when workers retire. No worker has been made permanent since the early 1990s, in Munidih Project colony around 25 per cent of the houses are empty. There are constant struggles of both company and administration against ‘illegal squatters’. Nowadays the majority of mining workers are hired through contractor or work in unofficial mines. They live in the villages surrounding the mines, some of them are still referred to as ‘tribal villages’. They lack the infrastructure of the colonies, they are even more threatened by displacement, but they are ‘mining villages’ in the sense that their economic and social daily life evolves around the mines, either by direct employment or related services.